In this first section of our Outdoor Insects Month guide, you will be introduced to several carpenter bee facts. It is a known fact that, at one point or another, we all become pestered by various types of pests. It does not matter if it is an ant running throughout the kitchen, or a moth flying around the light near the outside region of the front door, wide arrays of insects have the unique capability of being annoying and troublesome. Yes, insects are part of the natural environment. In fact, most have a unique and beneficial purpose to the environment. Unfortunately, many also have the ability to become a nuisance, a danger to structures, and even a danger to the humans that live in or near their natural habitat. One such insect is the carpenter bee. 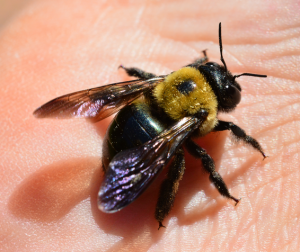 In Part 1 of 4 of our Outdoor Insects Month guide, you will learn many important carpenter bee facts and the secret to get rid of carpenter bees. Carpenter bees are relatively large insects that are actually considered to have a high level of economic-based importance. These insects are most active from the early months of spring, throughout the summer. These insects assist in pollinating various types of crops, as well as residential gardens. Unfortunately, they are known to linger in and around houses and other types of structures when in search of a mate and nesting sites. In fact, in reviewing carpenter bee facts, you will quickly discover that these insects are nearly 100% dependable on structures made by man for the wood that are part of those structures in order to build their nests. When carpenterbees hover around structures, they often make holes in the wood of those buildings. Once the hole is created, they will then nest there. Unfortunately, they attract woodpeckers. The woodpeckers will feed on the larvae within the nests of the holes and the result is a massive amount of damage. This is why so many individuals want to get rid of carpenter bees once they find the insects around their homes. As humans, most of us are naturally inclined to believe that all bees are harmful; however, when you review carpenter bee facts, you will find that these insects, unlike the honeybee and the bumblebee, are not considered to be “stinging” bees. The male carpenter bee typically hovers around the nesting site and shows signs of aggression, but, does not possess a stinger. The female carpenter bee, on the other hand does possess a stinger; however, she will not typically sting a human. That is, unless she feels threatened through being handled. While not dangerous to humans, the carpenter bees pose a significant danger to wood-based structures. For this reason, many wonder if there are pesticides available that will help get rid of carpenter bees.